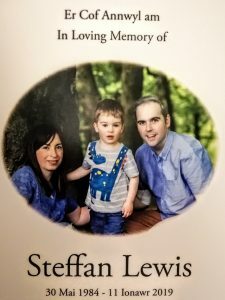 Tributes have been paid to the late Steffan Lewis AM, who died at the age of 34 after a courageous battle against cancer. 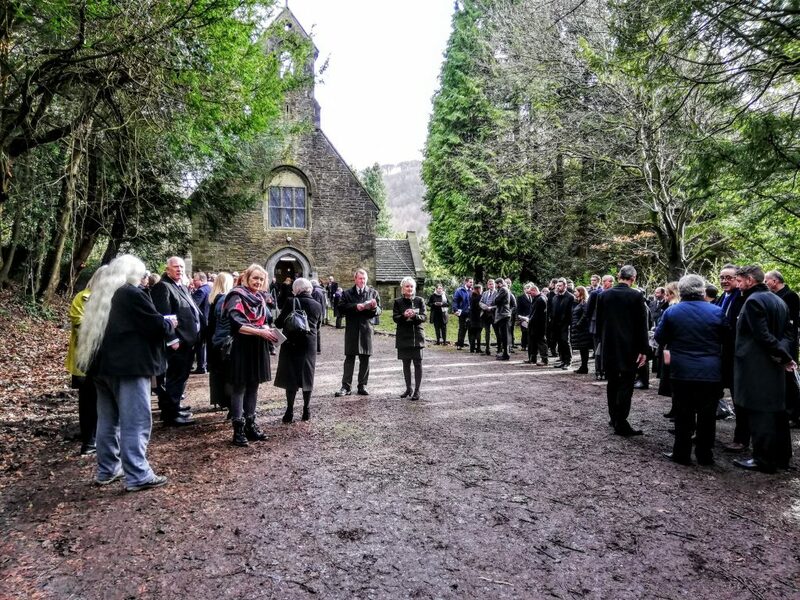 Steffan’s funeral took place at Abercarn’s Welsh Church, established by the nineteenth century campaigner Lady Llanover, Gwenynen Gwent. The text of tributes given at the funeral by Plaid Cymru leader Adam Price (translated text bracketed) and former Assembly Member Jocelyn Davies can be found here, together with a personal recollection of Steffan by Plaid Cymru History chairman Dafydd Williams. The funeral service on the 25 January 2019 was conducted by the Reverend Aled Edwards. [We are drawn together today by a great loss and a deep sense of pain. The loss of a son, the loss of a husband, of a father and a friend. And also the loss of a great Welshman. Wales has always been a country mourning the tomorrow that would never be. Because of our long history of loss, losing battle and brother. Losing Cadwallon and Rhodri and Gruffydd and Llywelyn. Owain Lawgoch and Glyndŵr. And to that roll call of princes we now add the name of another leader of hosts, our dear Steffan. And yet woven in to that pain, there is another truth to be perceived in the vacuum. Loss after loss – and yet the history of our nation is about resolving to live despite it all. There is something odd about the fact that we in Wales are still here as a nation – standing here only a few miles from the border, under the noses of the nation that for two centuries ruled the world. Steffan’s life, as a man of Gwent, a true Welshman, stands as a symbol of the fact that this frail nation, in the words of another borderer, Islwyn Ffowc Elis, proved it had a genius for survival. Wales continues to live today because we are determined that it should, because of that remarkable tenacity that bends without breaking. We saw that exemplified by Steffan’s final year, by his success in living to the full, contributing until the end, and snatching life from the teeth of his sickness so many times in order to continue to make a difference for the people and the country he loved and that loved him. In preparing this tribute I recalled the splendid tributes given by Steffan himself to Glyn Erasmus and Jim Criddle. From his early days he had counted Plaid veterans among his closest friends. Because Steffan understood that the struggle for Wales is like a relay race that will never come to an end. So all of us now bear responsibility not to let that baton slip from our grasp. In my last conversation with Steffan a few days before he passed we talked about many, many things. Steffan was a man, in Whitman’s phrase, that contained multitudes. He had a large heart and a huge intellect – and those things don’t often come together. He was a brilliant orator and a champion listener – and that combination is rarer still. He was as we know courageously honest and he wanted me to know he had only a short time left. As I held him there were moments of silent sadness, but we also laughed a lot. We pondered together the last message that he could convey through me to you. And his face was illuminated with a mischievous grin when he said, I know, we’ll ask them to pledge themselves to giving up beer and wine until we secure Welsh independence, forcing some of you into an excruciating choice between two of the things you loved the most. You know who you are. He really wanted to see that independent Wales he said. And he wished so much the prognosis would change. Knowing Steffan as we do I think he meant not so much now for himself but for Wales, for us, and for Celyn. The Monday morning after the terrible news I couldn’t face going into a Senedd with an empty seat. So I went for a run around the Bay. My face contorted with exhaustion and grief, an elderly gentleman offered his words of kindness and encouragement: “Not far to go now. Not far”. I stopped to look out over the clouds in the Bay, and suddenly shafts of sunlight cut through onto the water. In Sunday school we learned to call that Jacob’s ladder – but for me now these rays of sunshine will be for ever Steffan’s. And it put me in mind of the inauguration of Jack Kennedy, that other great leader who gave a nation new hope. Robert Frost was due to read out a poem he had written especially for the occasion, but as he approached the podium a sudden glare of sunlight meant he couldn’t read his text. So instead he read out another poem from memory, “A Gift Outright”. “The land was ours before we were the land’s. The poem is about a sense of one-ness between a people and their land. Monmouthshire perhaps is Wales’ Massachusetts, Virginia its Gwent, where the magnetic pull of the border is strongest, where to be Welsh is not an accident of birth but an act of defiant will. Do we choose to withhold ourselves from Wales, to follow the easy paths of personal ambition and material success, or do we sacrifice ourselves for Wales? Steffan’s answer was never really in doubt. His mother Gail made sure of that. Steffan found salvation in surrendering himself to Wales. His life to his last was a gift outright to the nation. Cymru to Steffan was par excellence a country of companionship. He wanted to plant it thick as trees along mountain-top and valley floor, and for our shores and our rivers to constantly water its roots. He wanted us to be indissoluble, inseparable, compatriots all, with our arms around each other’s necks, Cuumraag in Manx means comrade after all. And this dear comrade wanted Wales – all of Wales – to cwtch up close. Like his great mentor and hero Phil Williams, Steffan railed against what Phil called the false ‘psychology of distance’ which divided our nation. “We should talk about ending the Walian. We are not south Walians, north Walians, west Walians etc. Yes, Wales is a community of communities but the artificial regionalisation of Wales and the cynical divides based on language, geography, urban v rural are the tools of those who seek to divide us to protect the political status quo, for their narrow self-interest. Wales is at its best when Wales is one – One Wales (yes, with capital letters), facing common challenges together. This is needed more than ever as our country faces a full frontal assault from the UK Government”. Steffan was a proud Gwentian, but keen to emphasise its fundamental Welshness. How Zephaniah Williams and John Frost were both Welsh speakers . As was the miner Edward Morgan – the Dic Penderyn of Monmouthshire – executed at age 35 as a leader of Tarw Scotch. Though it was the working class Welsh culture of these valleys that was the crucible in which Steffan’s personality was forged – he was also quite struck, and no doubt amused, by the stories of Lady Llanofer, insisting her staff only spoke Welsh, and wearing a bespoke Welsh costume, made out of the finest materials, with a superb diamond leek in her black silk hat. He was himself a gem of a man, and so it’s fitting that he will be followed by a Jewell. And I know that it gave Steffan great comfort to know that he could pass the baton on to someone equally able and committed. He touched us all in different ways, and it stings to know we’re no longer able to reach out and touch him. Before I conclude I should like to read out some special messages of condolences that we have received. 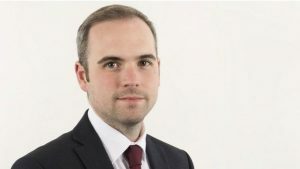 “I was very saddened to learn of the untimely passing of Steffan Lewis and, on behalf of the Irish Government, I extend my sympathies to Steffan’s wife Shona and his son Celyn and to all his colleagues in Plaid Cymru and the Welsh Assembly. He will be remembered not only for his notable career in Welsh politics but also for his drive and passion in furthering bilateral relations between Ireland and Wales”. In remembering Steffan here now our hearts are both beguiled and broken. But he would not want us to despair in this our land of living. So every morning when we wake let’s wake for him. When we rise, let it be the rising of a nation. As Steffan’s years were halved let’s re-double our efforts on his behalf. Steffan never learned to take his time so nor should we. He achieved so much in such a short while, inscribing in the arc of his life a great promise of things to come. Its realisation now falls to us. Our future may lie beyond the horizon, but it is not beyond our control. Nothing is inevitable, no irresistible tide of history will determine our destiny. It is up to us. We do not have far to go. The future is in our hands. So let’s build it together in the name of one we loved. And who loved us in return. Such was the strength of that love that one nation would never be enough to contain it. Steffan dreamed of creating a Celtic Union so he fashioned his own in bonding forever with Shona. So it’s fitting we should say our goodbyes on that great Scottish poet Robbie Burns’ birthday. From the tributes paid to Steffan over the last two weeks it is clear that Wales has lost one of her brightest and best political figures of our time. But Steffan was so much more than a public figure – husband to Shona; father to little Celyn; son to Gail; stepson to Neil; brother to Dylan, Sian and Nia, an uncle and son-in-law; a keen historian; a nationalist and internationalist; a Celtic supporter; and a friend to many of us; and more besides and we’re here today to celebrate and remember all he was. And I’d like to share the story of my friendship with him. When he asked me at Christmas if I would do this eulogy I started to think back to when our paths first crossed. That’s about 25 years ago. His father, Mark, used to bring him to Plaid Cymru meetings and Steff’s interest in politics was sparked by the Islwyn by-election. Soon after, Gail brought him to the house because he wanted to discuss bullying in schools with a school governor. He was just ten – so mature; so polite; and so serious. And he wasn’t so much worried for himself, but for smaller children – like his younger sister Sian, and to whom he took his bigger brother responsibilities very seriously indeed. He wanted Sian to be safe. Gail was, without doubt, the driving force in those formative years and it is to Gail that Plaid Cymru owes a massive debt of gratitude because she gave Steffan the gift of his love for Wales; for its language; for its culture and history; and for his nation. And, not forgetting, the typewriter she gave him from which the ten-year-old Steffan fired off letters to various people about important matters of the day! He hadn’t at that point decided to be a politician. In fact, he was quite set on becoming a police officer. So, in typical Steffan style, sent one of his letters to the local police station about his intentions. So impressed were they that Steffan and Sian were treated to a tour of the station, put in the cells, and had their fingerprints taken for good measure. So, even at this tender age he had the directness and easy charm that impressed the people he met. He was still a schoolboy when he made his first visit to the Commons by the invitation of Dafydd Wigley – after Steffan had written one of his letters, of course. 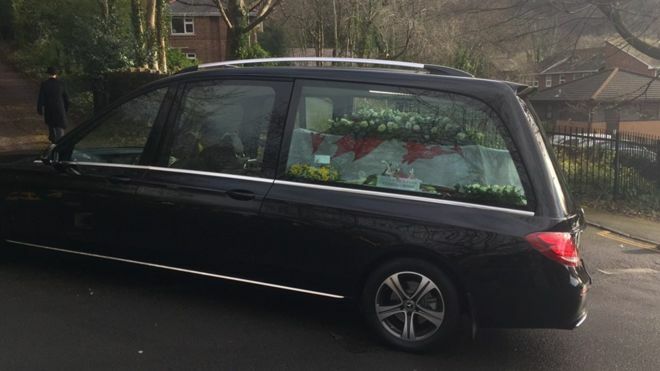 Dafydd said he was immediately struck by a young man who had a passion for Wales; who already had an understanding of politics; and had a maturity beyond his years. 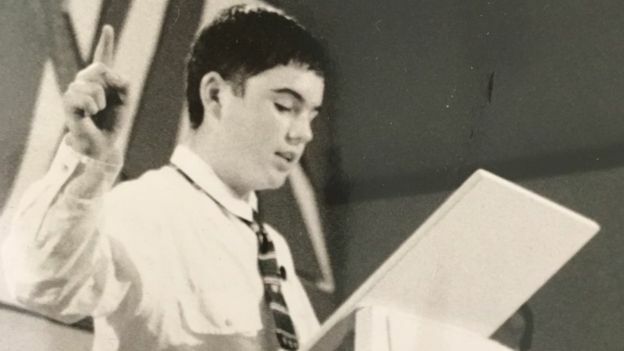 As a teenager, Gail continued to encourage him to maintain his interest in politics, and he seemed 28 speaking at conference – but was also happy tagging along with whatever was going on locally. He helped us out in the historic Assembly elections of 1999, and it came as no surprise to me when he later contacted me about a work placement at the Bay. He was 15 and he spent that first summer making his way down from Tredegar to help me, and to learn, meeting everyone, and just being part of the excitement of it all – I think he also tried out my chair for size while I was out of the room! – already planning no doubt. On the journeys home with Mike and I in the car he talked of his plans for A levels, of Welsh history (I think he’d visited every castle in the land) and of what devolution meant to him – the dawn of a new Wales. We lost touch with our young friend when he went off to university and then travelling – and he told me later that during that time he’d even flirted for a while with the Wales Independence Party. I think he’d felt a profound deflation when it became all to obvious that the powers the Assembly had at that time were not going to build the Wales he was expecting to see. It was 2006, with the Blaenau Gwent by-election looming, and our need for a Westminster candidate that he came back into our lives. Mike, of course, had the task of ringing him. By now he’d met the love of his life, Shona, in a pub in Cardiff when she was visiting from Inverness. He knew she was “The One”, and with his usual vigour and determination pursued her back to Scotland. He was working there and had joined the SNP, and had become a Celtic supporter – but you can’t have everything! Becoming a Celtic supporter wasn’t, by the way, a shallow attempt to impress Shona. It was, Steffan style, thoroughly thought through and based on the fact that the team was originally formed with the specific aim of being a way of raising funds to feed poor children in the east end of Glasgow – well, that’s what he’d tell us when they were not on top form! Luckily for us, Shona was fully supportive of him standing and he agreed to fight the seat for us. And what a candidate! Dai Davies recently told me that, in all the hustings they attended, all he need do was pray Steff answered questions before him and then agree with whatever Steff said. Steff was just 22. And already had the public speaking skills of a seasoned professional. He and Shona came home to Wales and settled in Islwyn. It was a partnership of true equals and they were always 100% supportive of each other. I know he was happy in Scotland, but was pleased to be back near his family and to see his little sister Nia as often as possible. It’s from this time really that he became like family to us, and not just Mike and me, but the whole Islwyn Plaid Cymru clan. Over the years he’s paid some lovely tributes to me, and claimed I took him under my wing. Well, he was a very polite boy. I’m not sure that was entirely true. It’s probably more accurate to say I just took the opportunity to light a blue touch paper that was already there – the intellect, the talent and the drive were already there. All he needed was the benefit of some wise experience – and a little time and space – I think I gave him that. Yes, I gave him that. And if you light a blue touch paper, it is best if you then stand well back! The real step-change for Steff was going to work for Leanne, and I know he was incredibly proud of the work they did together, and being right at the centre of the action was the perfect finishing school for him. And I’m sure she’d agree that, quite apart from his professional abilities, Steff was one of those nice people to have around – serious, yes a bit straight laced too, but he was really funny – we laughed a lot together, even on those very dark days. He had his anxieties. He confided in me that he was worried he wouldn’t be taken seriously as an Assembly Member because of his age. Of course, his fears were completely unfounded. He was, after all, the star of the show – I might be a bit biased on that front. I’ve come now to the really hard bit. What happened to Steffan is a tragedy beyond words – but somehow he found the words for it. The openness, clarity and tenderness with which he spoke about his experience and feelings was extraordinary. It was a noble selfless endeavour to tell his story in order to help others. And he did with a frankness that was truly touching. He and Shona, together, demonstrated a strength and generosity of spirit that made this last year easier for us all. And the dignity with which Sona has bore her grief is inspirational. Where she found the strength and fortitude, I have no idea. She is one of the most remarkable women I have ever met. Steff and his whole family were on the most terrible of journeys and they invited us to share it with them and they were always grateful for our company and considerate of our feelings. And they did with a positivity that was truly humbling. They comforted us. There are far too many people to thank individually for all the support they’ve received, and I know they are overwhelmed by the love and kindness shown to them from all quarters. But Steff would want me to say how proud he was of Nia’s fundraising work for Velindre, and he was especially grateful to Rhuanedd Richards for being a rock for Gail, who is bearing the utter despair that no mother should ever face. The last time Mike and I saw Steff at home with Shona and his sweet sweet boy Celyn, he said one of the good things that had come from this was that his family were even closer than before, and he was looking forward to watching football that weekend with brother Dylan and his very special friend, Neil, his stepfather. He was also making plans with us to make a last appearance at the Senedd to make a final statement to you – always planning, always working towards something. I don’t know what he intended for that statement – maybe he’d have told to, Harri Webb style, to “sing for Wales”. Steff certainly sang for Wales. But I know for certain he would have thanked you all. So, I do that now for him. Thank you. I got to know Steffan during the first elections to the National Assembly in 1999. Phil Williams was standing for Plaid in the Blaenau Gwent constituency and as a friend of Phil and former General Secretary of Plaid Cymru I took part in the lively campaign run from our office in Tredegar. Steffan was a regular attendee, turning up almost every day after school was over. He must have been 14 at the time, but it was clear to all of us that he had great potential. As time passed it was good to see how he put that talent to good use. When Steffan addressed the Plaid conference and National Council, people listened. His clarity of understanding and analysis of complex issues – especially the bumpy progress of devolution – was a revelation. His ability to put ideas across without the slightest pretension won him a growing following. 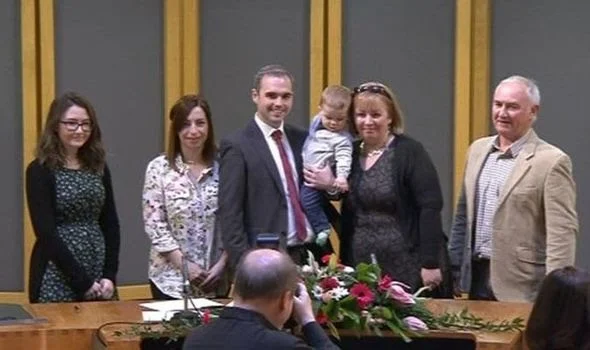 It was no surprise to see him chosen as Plaid’s lead candidate in South-east Wales or to hear of the respect he gained among members of all parties in the Assembly – in a way that called to mind the respect accorded to Phil Williams in previous years. Around eighteen months ago Steffan made time to travel to Swansea to meet Plaid members in a well-attended social function and brief us on all the latest developments and complications following the Brexit referendum. It was an enjoyable and inspiring occasion that succeeded in boosting activities in Swansea and Gower, an evening we will never forget. It came as a huge shock within a few short weeks to hear the cruel news of his diagnosis, and I cannot imagine the pain and sadness felt by his loved ones. We extend our heartfelt sympathy and best wishes to Shona, Celyn and all the family. This entry was posted in Newyddion Blaen, Tribute on 04/02/2019 by Rheolwr Gwefan.